Disclosure: I was sent a copy of this book by its publicist in exchange for my honest review. 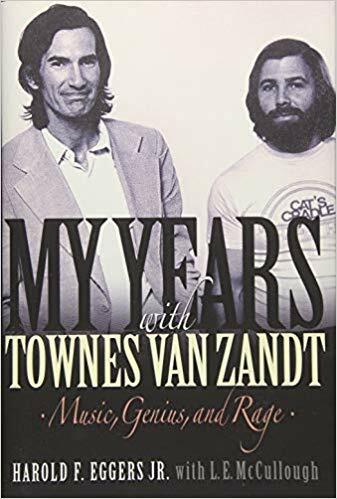 Over four months ago, a publicist wrote to me offering a copy of this memoir about Townes Van Zandt. Only in the last week or so when I finally got around to opening it did I realize the honor I’d received. I’m really grateful I got to read this one; and I’m honored that I was asked. Thanks, Jennifer. Townes Van Zandt was a tortured genius and one of the finest troubadours this country has known. Harold F. Eggers Jr. was Townes’s road manager, business partner, and much more, for some twenty years. His memoir here (cowritten with L. E. McCullough, who has the writing experience) is very much about telling Townes’s story, but Eggers’s own life is well-represented, as well. I respect the format very much. The remarkable life of Townes Van Zandt clearly inspired the writing, and that’s the name that draws readers to the book. But Eggers has lived, as well, and I’m glad he’s present. The book opens with the early years Eggers and Townes spent together, and then flashes back to a very brief telling of Eggers’s childhood and his service in Vietnam before he went to work for Townes (thanks to his big brother Kevin Eggers, who had previously worked with Townes and set up his veteran younger brother with a job to help him out). His tour in Vietnam plays a role in the rest of the story; Eggers credits the things he saw there with his ability to adapt to this wildness of sharing a hotel room with Townes, and believes his thrill-seeking and attraction to danger was about chasing something he’d seen in war. As a parallel, Townes had tried to enlist in the armed forces but been turned away because of the electroshock therapy he’d received as a teenager (also an enormous event in Townes’s life which would follow him forever). As Eggers tells it, Townes’s disappointment cast a long shadow. There is everything here that a Townes fan wants: insider information, jokes and stories, and that enormous and overarching sadness that we feel in his songs. (Well, almost everything. We still don’t know much about Townes’s early life, pre-shock therapy, because he didn’t remember it, himself. This is a painful hole in the record, in my opinion. But Eggers couldn’t resolve it, and he’s right not to try. I sure wish someone had approached Townes’s parents while they were alive…) It’s a thorough telling of Townes’s final twenty years or so, as seen by Eggers, who does not claim to know what he wasn’t there to see; but the two men spent a lot of time together when on tour, often living as roommates even off the road. Eggers quotes Guy Clark: “Harold, how can you stay in the same room with Townes Van Zandt? You have been doign this for years, man. I’m his friend, too, but it would wear me out. How do you put up with it?” After years of reflection, Eggers is ready to say that growing up in a large family and later his military service gave him “the ability to routinize almost any sort of irrational behavior.” Eggers has his tricks: when Townes pitches fits in public and is on the brink of getting them arrested, Eggers tells him he needs to get onstage right now; this always works. He sees Townes sabotage recording sessions and huge live shows, and wishes the musicians in the studio only knew how to manage Townes the way he does. As told here, the two have a symbiotic relationship. Eggers babysits and manages Townes, enabling the career he was able to have, however wracked and traumatized. But Townes helps Eggers mange his own demons, too. There’s a huge amount of love here. At the beginning and the end and in between, Eggers relates that Townes wanted this book to exist, and wanted to be sure it told the whole story, and not just the pretty stuff. “Tell the truth, no matter what… do not whitewash anything. Let all the ghosts and demons have their say.” Although Eggers’s love for Townes rings loud, I think he’s honored his friend’s wish, too. This is one of the ways I want to contrast this book with another. Without Getting Killed or Caught, a recent biography of Guy Clark, was a rich source of information about Guy, one of Townes’s best friends. But it was too saccharine in its praise, didn’t let all the ghosts and demons have their say. Eggers did, and I appreciate him for that. The style of My Years with Townes Van Zandt is straightforward, the writing style of a man with a story to tell, rather than that of a writer of craft and artistry. No complaints; Eggers’s voice comes through clearly, and I can feel his personality, and I hung on every word. But it’s a straight relating, and not a crafted piece of creative nonfiction. I’m a little surprised, since there was a ghostwriter involved, that it didn’t get a little more polish. But I’m not sorry. One final detail before I tell you what an important read this is. Several appendices offer a thorough discography (and then some) and Eggers’s recording philosophy, for recording live shows (which have yielded such discography). The student of Townes’s music will be well-served: I know some of what I’m shopping for next. For the Townes fan? An absolutely essential volume to keep and study. For the reader not so sure about Townes? An important look into the music industry of the 1970s-90s, at counterculture and American roots music, and at an artist you will soon become a fan of. Don’t miss this one. Rating: for the sake of 8 songs. Diverse writers answer the title’s prompt with essays that are cutting, furious, delicate, generous and everything in between. Literary Hub contributing editor Michele Filgate thought she was writing an essay about her stepfather’s abuse, but it turned out she was really writing about the relationship with her mother that allowed such abuse to continue. After years of work, her essay was eventually published by Longreads under the title “What My Mother and I Don’t Talk About.” Readers and writers responded strongly, and Filgate’s piece now leads this astonishing anthology. 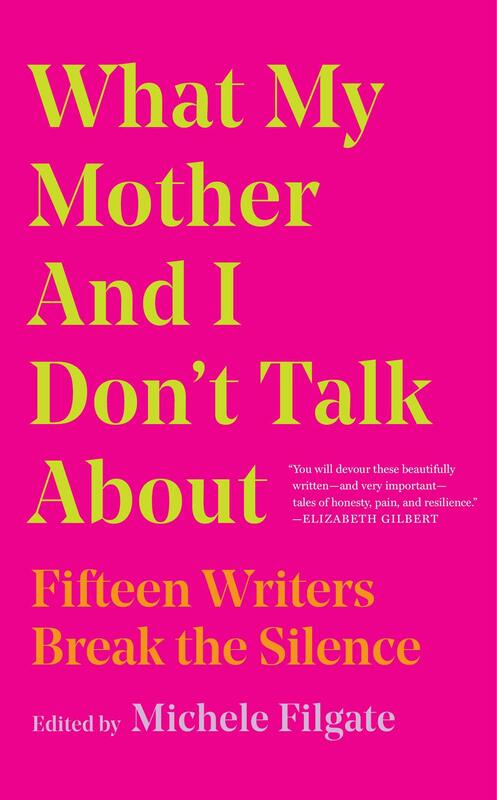 What My Mother and I Don’t Talk About: Fifteen Writers Break the Silence follows that essay with a breathtaking range of responses. Filgate writes, “Mothers are idealized as protectors: a person who is caring and giving and who builds a person up rather than knocking them down. But very few of us can say that our mothers check all of these boxes. In many ways, a mother is set up to fail.” And while many of the essayists featured here reproach mothers who have hurt them, there are also apologies, confessions and unsolved mysteries. These essays bring many perspectives and deal in self-awareness, too. In “Thesmophoria,” Melissa Febos considers her close relationship with her psychotherapist mother by recalling myths, chiefly that of Persephone and Demeter. “We often love the things that abduct us.” Brandon Taylor wrestles with the pain his mother has caused: “It’s strange, really, that to grasp that which has hurt you, you must trust it not to hurt you when you let it inhabit you”–or when you write about it. Alexander Chee hides the abuse he’s suffered from his mother because of the tragedy they’ve endured together: “This is how we got each other through.” Dylan Landis seeks to understand her mother better through an old apartment building, and a possible former lover. Amid the layered traumas of race, nation and gender, Kiese Laymon asks his mother: “Can we please get better at loving each other in America?” Carmen Maria Machado finds her own conflicted feelings about parenthood linked to her mother’s harsh treatment. And André Aciman considers his deaf mother’s language, separate from words, and what it taught him. Leslie Jamison closes the anthology with an essay exploring her mother through the eyes of an outsider to the family unit: her mother’s first husband’s unpublished novel about their marriage. It is a fitting conclusion, with that surprise perspective and a careful, loving attention to the woman who came before the mother. These collected essays are variously rich, tender, angry, despairing and clinical. The result, greater than the sum of parts, is part paean and part denunciation, intelligent, heartfelt and wise. What My Mother and I Don’t Talk About is a shrewd, glinting collection of beauty and pain: a gift for mothers and their children. This review originally ran in the March 19, 2019 issue of Shelf Awareness for the Book Trade. To subscribe, click here. It has been a long while since I read a book given me by Fil (three years! ), but I remain grateful. I’ve been recently traveling in the Big Bend region (and you can check out my travels here), and so I packed this one along. Hallie Stillwell was born in Waco, but when she was a year old the family moved to West Texas, and (aside from three years in New Mexico) she would live the rest of her life there. The towns she knows best and describes here – Alpine, Marathon, San Angelo, Ozona – are familiar to me from my visits to the region, and there is always a warm fuzzy feeling when I recognize the places I encounter in books. Hallie moved to Presidio in 1916 at age 18 to teach school, leaving at 20 to marry a rancher, Roy, in the borderlands. She would be by his side until his death in 1948. She was born in 1897 and died in 1997, just shy of her 100th birthday: that fact alone would make her memoir significant – just think of all the changes she’d seen. As Hallie briefly catalogs in her preface, she lived through Pancho Villa’s revolution; the Spanish influenza epidemic; the 1929 crash and the Depression; two world wars; and countless technological advances. This is her memoir. 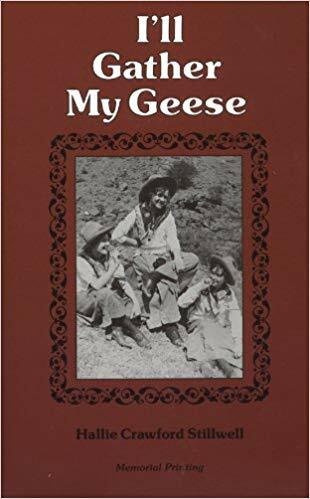 The title is explained: her father thought, when she headed to bordertown Presidio (where I ate lunch just the other day) as a teenager to work, that she was chasing wild geese. She told him that she’d gather them then. This is a phrase that recurs, and shows the early strength of character that would mark her life. This book has a style I recognize: the writing is uncomplicated, straightforward, not a work of fine art but of reportage. I did note some fun colloquialisms: “not worth a tinker’s dam,” “so upset that I could have fought a circle of saws.” But the point is the stories, not the writing. I also noted Hallie’s habit to sum up her feelings. Often sections of text end with a remark about how contended and happy her family was; or, conversely, about how frustrating Roy could be, with his taciturn nature and resistance to change. However Roy irritates her, though, or however often she bemoans her own inexperience and ignorance of ranching operations, she always returns to the refrain: “I remember thinking… ‘I hope our lives will always be this way. '” “I felt that my life was complete… I often wondered what more I could want.” The overall effect is of a woman pleased with her lot, through the unbelievably hard times and Roy’s often obnoxious (though often funny) behavior. This kind of refrain could get tiresome, as Pollyanna as it is. But it felt authentic here. Perhaps Hallie is trying to convince herself as much as she is us, in looking back at a life that was hard but worthwhile. It feels real. It also feels in line with the untutored, amateur, honest memoir style. I was a bit disappointed to see this book end with Roy’s death, as she lived almost another 50 years after that point. The “In Memoriam” epilogue to my memorial printing says, “Roy’s death in 1948 at the beginning of the longest drought of the century impelled Hallie to diversify. Having already mastered the roles of teacher, rancher, marksman, and mother, she became a justice of the peace, barber, journalist, author, storekeeper, RV innkeeper, and celebrity.” (Markswoman, please!) But none of these stories are told in this volume. I think that’s a loss. But what is here is fine reading, and I do recommend it. Rating: 7 head of cattle. A shadow of tragedy hangs over this lovely, lyric memoir of Tutsi childhood in Rwanda, but the author’s love for her strong mother remains central. 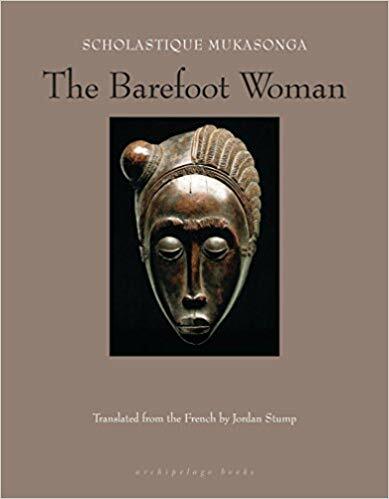 The Barefoot Woman by Scholastique Mukasonga (Our Lady of the Nile; Cockroaches) is a loving tribute to a strong mother and a striking work of memoir. Mukasonga and her family lived as exiles in Rwanda in the years leading up to the genocide of the Tutsi. This time in her life, when they were all together and alive, was short, but Mukasonga has vivid memories, especially of her mother, Stefania, a leader in the makeshift village where they were regularly terrorized by Hutu soldiers. In an earlier memoir, Cockroaches, Mukasonga depicted the horrific end of her family. Here, she focuses on her mother: Stefania is a hard worker, always with her hoe in hand; a healer with a medicinal garden of grasses, tubers, roots and tree leaves; a “highly respected matchmaker”; and a dedicated, ever-vigilant protector of her children. Saving them was her “one single project day in and day out, one sole reason to go on surviving.” She is not a hero with a single dimension, though. In Mukasonga’s warm telling, Stefania has personality, a sense of humor and a deep love for her family. The book opens and closes with dreamlike sequences. At the beginning, in the narrator’s memory, Stefania reminds her children of their duty to their mother upon her death. At the end, Mukasonga describes a dream about her mother’s uncared-for dead body and those of so many Tutsi. This sets the tone for the rest of the memoir, which often feels dreamy as it turns to childhood memories. 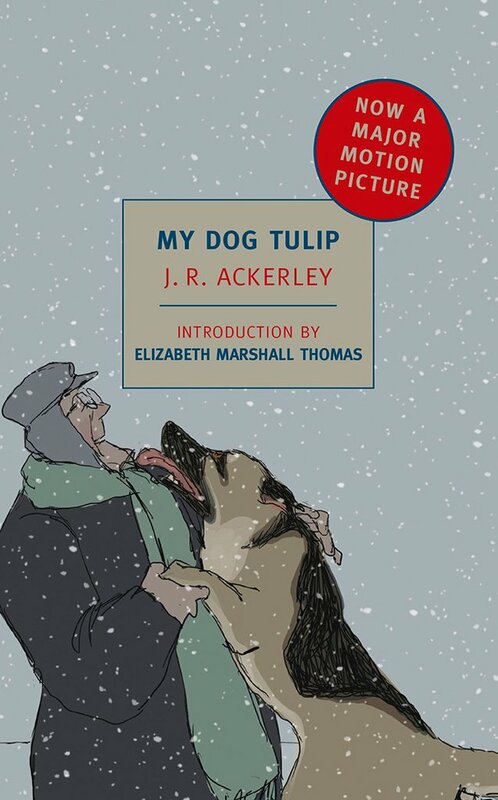 Extraordinarily, this story is at times horrifying in its content and at other times playful; lyric in its style and tender in its handling of the central character. While the reader’s knowledge of the genocide to come hangs over the narrative, the everyday events often retain a quotidian feeling; Stefania and her neighbors worry over their children but also laugh and celebrate and arrange marriages. As a literary work, this establishes a rare balance. Jordan Stump’s translation from the French beautifully conveys this sense of both tragedy and day-to-day joy. The Barefoot Woman is also an essential record of traditions and a way of life that are in danger of disappearing. It describes the inzu Stefania builds, with great effort, in exile: a traditional straw-dome house “that was as vital to her as water to a fish.” The importance of keeping a fire going, and why a mother would borrow fire from a neighbor rather than use a match. The significance of sorghum, “a true Rwandan” crop, and why Stefania insisted on a cow, the traditional gift for her son’s marriage pact, even in the inhospitable new place where cows were no longer a part of their everyday lives. This is an adoring, gorgeously rendered memorial to a mother and testimony to a people. This review originally ran in the November 19, 2018 issue of Shelf Awareness for the Book Trade. To subscribe, click here. Rating: 8 little loaves of bread. 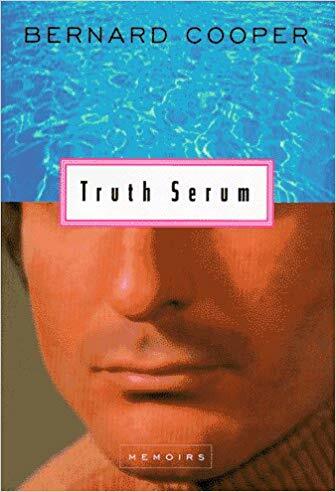 Among the central concerns of Truth Serum lie questions of truth and memory. This is a memoir-in-essays of Cooper’s coming-of-age in Hollywood from the 1950s onward, including his identity as a gay man in the early days of the AIDS virus. I found several elements I appreciated from Maps to Anywhere: lyric language and a profound attention paid to the world. I was reminded of Mark Doty in the moments that Cooper leans in, seeming to slow down time, to examine what’s around him, that the rest of us might have called the everyday. Maps to Anywhere, as I remember it*, had some longer essays but more short ones, several of which qualified as prose poems; by comparison, the essays in this collection are on balance longer, and while the language is undeniably lovely, few of these shapeshift toward poetic form. These essays more frequently offer clear narrative structure. One shorter one I’d seen before was “The Fine Art of Sighing,” about the sighs of three family members. I’m pretty sure* this one reappears in Short Takes (ed. Judith Kitchen), and/or I’ve read it for class. I also really appreciated the opening piece, “Where to Begin,” which is very much about that problem of creating art: that the biggest question is not what to put in, but what to leave out. Else we’ll end up trying to paint, or write, the whole world, and be defeated before we begin. I loved “Burl’s” for its epiphany of gender fluidity. “Against Gravity,” about weightlifters and men and mortality, was a lovely longer meditation… I really enjoyed how it ranged and returned. “If and When” is a beautiful, tearing-open essay about discovering the narrator’s HIV status, and his partner’s. (I am reminded of an essay Cooper contributed to… some essay collection, about handling the public’s response to his revealing private information, this information in particular.) It’s a simply gorgeous and wrenching portrayal, and I think it’s a generosity. “Tone Poem” answers my statement above, about there being less poetry in this collection than in Maps. It’s not so much a poem itself, though, I argue, as it is about poetry, about finding something beautiful in the mundane. “Train of Thought” was the essay I thought might be a poem: it explores the etymology of that phrase, ‘train of thought,’ and the music and language of trains. Which I misread, initially, as ‘the same as a train.’ This attention to language and sound, and a final memory about a boy who memorizes numbers, made me feel a little floated above the world. Lovely. 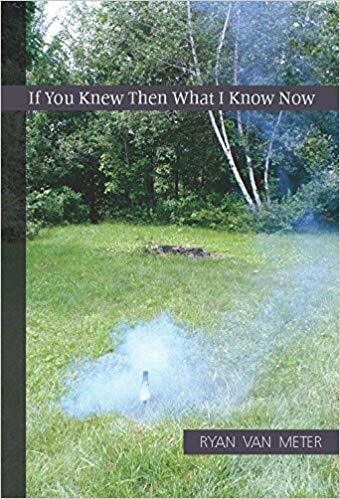 Finally, I was reminded of Ryan Van Meter’s If You Knew Then What I Know Now. Most obviously, both essay collections handle the narrators’ coming-of-age and coming to terms with being gay men. But that’s not all, and I hope I’m not guilty of that kind of simplification. I’m thinking more about the ordering of essays in both collections, where they proceed more or less chronologically, and with an overarching opening up from the immediately personal (and confusion about the subject at hand) to the outward-facing, the public issues involved with being a gay man (for example) in the 1980s as an unknown virus blooms. Another lovely one from Cooper, although I missed the poetry in Maps and hope to get back into that book one day, too. *I owe y’all an update on this at some future date, but I’m about to be undertaking some travel and have been packing all my books to go into storage… so the other books I’ve mentioned here are not at hand as they’d usually be. I already miss my library!